Every Friday, I’m sharing code snippets that I use to customize WordPress. Feedback/suggestions are always welcome! For more information, check out the first post in the series. *If you don’t see this field, click “Screen Options” in the top right corner while editing a post to enable it. You might want to change the default number of words, or add a link to the post instead of an ellipsis. While you’re at it, you could also make the post link more useful for visitors that are accessing your site with a screen reader. It’s easy to hook into and modify the default excerpt with a few filters. The has_excerpt function returns true for posts with manual excerpts, and false for all other posts. 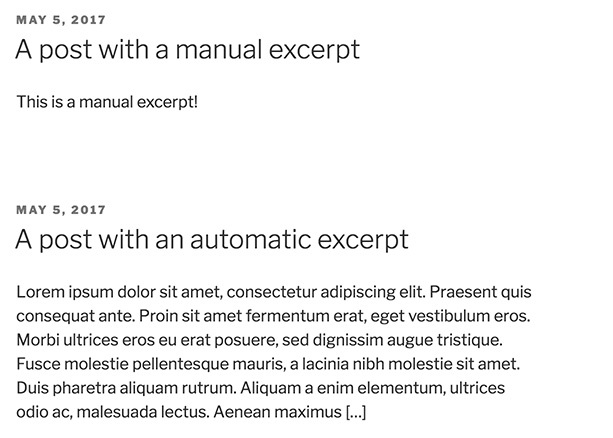 If you’ve gone to the trouble of adding text to the “Excerpt” field, you probably used complete sentences, so adding an ellipsis after the excerpt text doesn’t make sense. If you’re relying on WordPress’s automatic excerpts that cut you off at 18 words, though, including an ellipsis will probably look better. Using this code snippet, all of your “Continue reading” links will visually look the same. For someone using a screen reader, however, the post’s title will be read aloud as part of the link. This means that skipping from link to link won’t just repeat (rather uselessly) “Continue reading”, “Continue reading”, “Continue reading”… it will actually say “Continue reading ‘A post with an automatic excerpt'”. Don’t use display: none as that will hide the content from everyone, including screen readers! An important distinction here is that with excerpt_more, you’re just modifying what comes after the automatic excerpt. 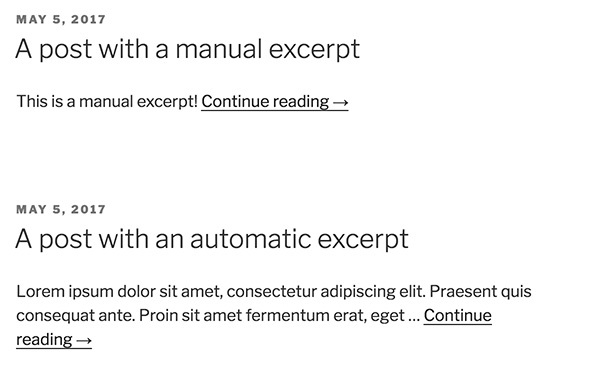 With get_the_excerpt, you’re actually modifying the whole excerpt, so you want to add your “Continue reading” link onto the existing excerpt by concatenating the two. I usually put this code in my theme’s functions file, but it could also work in a functionality plugin, with the caveat that your blog has to be using the_excerpt instead of the_content for it to have any effect. If you do include this in a functionality plugin, make sure the CSS for the screen reader text class is loaded as well. 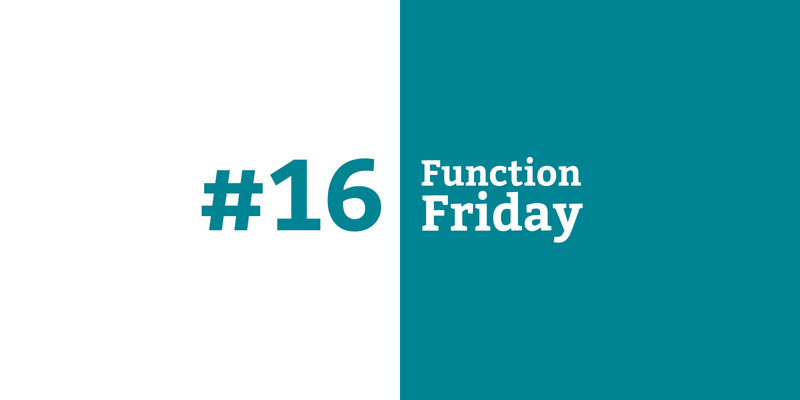 There’s more info about both of these options in the first Function Friday post. Hi! Thanks – this is really useful! Is it possible to have the “continue reading” link only show if the manual excerpt is filled out? I’ve upped the automatic excerpt to 500 words so that the full post will show if there’s no manual excerpt, but I don’t want a “continue reading” link after the full content. I’ve read a lot of how-to articles and I can’t figure out if this is possible with WP. One note is that the_excerpt() isn’t quite the same thing as the_content() even if you increase the word count to include all text – it strips tags, doesn’t run shortcodes, etc. So depending on your post content it might be worth modifying this even further to have it return the_content instead of the_excerpt unless a manual excerpt is set. That would need some more testing though! Awesome thanks – I’ll try this. I don’t want to use the_content() as many of the posts will have videos and I’ve already sorted that part out with featured videos. I didn’t see this till now! I’m going to blame the BC election for totally derailing this week. Thanks again! Makes sense, let me know how it goes! And no worries – I should have emails send when there’s a comment reply instead of having to check back. Putting it on my to-do list! That totally worked – thank you! Get in touch with questions, for a quote, or just to say hello!